In the days since allegations against Alabama, Mississippi State and Tennessee were posted by Yahoo!Sports in one of the most thoroughly researched and vetted pieces we’ve ever seen, we watched aghast as the biggest voice in national sports media either ignored or downplayed the allegations. Legions of national writers and talking heads charged to the defense with the “poor mistreated athletes” line. Many of those same apologists further their argument by absurdly postulating that the fact that Alabama’s D.J. Fluker (and others) apparently received illegal benefits is justification to open the doors to legalizing pay for play. All those who echo this sentiment couldn’t be more wrong. Opening this Pandora’s Box and legalizing this type of activity would destroy the sport we all love. It would turn NCAA football into a mini NFL. To follow this perverted logic to its natural conclusion, college athletics would eventually be replaced by a NFL minor league. Forget the on-campus passion and pageantry of Auburn v. Alabama, we’d all cheer just as hard for the Tuscaloosa Titans (a minor league Tennessee franchise) or the Auburn Falcons (a minor league team for the Atlanta franchise) right? You can’t even open that door a crack without unleashing the floodgates. The sport that we know and love would never be the same. Is that truly what anyone wants? That’s why the NCAA can’t look the other way when clear and incontrovertible proof of violations like those of the Yahoo! report are exposed. Those floodgates must remain closed. The “everybody does it” justification simply doesn’t wash.
Auburn apparently doesn’t. 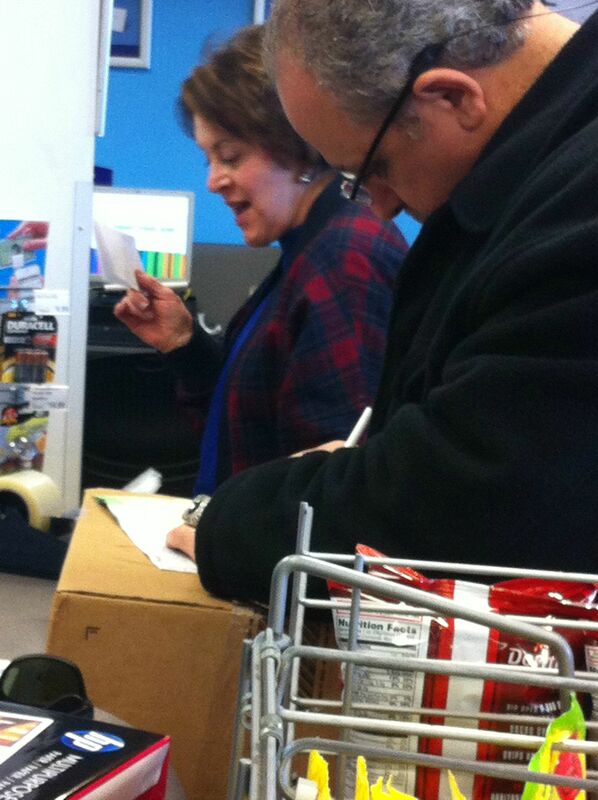 Stop listening to the bagger down at the grocery store who “knows” Aubren cheats. Quit taking the snickering word of radio hack Paul Finebaum who claims Auburn “got away with it”. Listen to the NCAA. It has spoken. The sport’s governing body spent months examining every speck of dust around the program and found no violations. Nothing. No matter what you’ve heard on message boards, from crackpot conspiracy theorists, from your neighbor’s cousin or from those too lazy to pay attention to simple fact, the NCAA found nothing. And it tried. In fairness to those who do things the right way, those who violate the rules deserve repercussions. Many of media members now crying for leniency for these poor impoverished kids are the very same ones who crucified Cam Newton’s family for allegedly considering an offer of payment from Mississippi State. Where was the “poor downtrodden athlete” banner when Newton and his father were being wrongly excoriated as the living symbol of all that’s wrong with college athletics? To fly the “poor athlete” flag now is a double standard. And it’s wrong. Those who violate the rules of the game should be punished. Period. That’s why if violations were uncovered against Auburn, we would be first in line calling for appropriate action and for those involved to be disciplined. That’s why Alabama must pay. Please don’t hand us the “poor kids need the money” line as an excuse now. That’s a self-serving farce. These “poor kids” get their college education paid for, they get the chance to play their way into a multi-million dollar professional career and the opportunity to earn a college degree. They’re provided with spending money, financial aid, room and board. None of them are starving or homeless. How many parents with college age children get the same benefits? 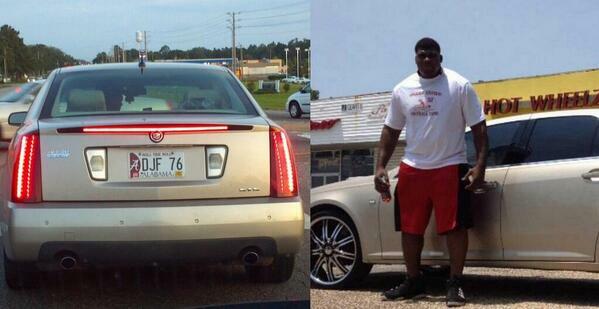 Much has been made nationally of Fluker’s abject poverty and of how he once supposedly lived in his car. That heart-tugging story is used as rationale for Fluker taking whatever graft was tossed his way. Was he so poor that he kept his spare change spread across three different bank accounts as the Yahoo! report noted? Did his alleged lack of spending money require an infusion of nearly $40,000 and some new furniture to boot? Can any of you say with a straight face that nobody on that campus noticed poor Fluker driving a gold Cadillac with sparkling new rims and a personalized license plate? That’s the problem with this entire line of thinking. Where does it end? Is a set of high-priced rims truly a necessity? For those who have watched this saga over the years, the era of plausible deniability has passed. The massive paper trail that follows Fluker validates everything we’ve seen swept under the Crimson carpet over the last decade. Chargers. Laptops. Fishing trips. Suits. Rims. House sitting. Rental cars. Players flipping commitments and being sequestered by boosters. It’s a wide brush and it now paints all with suspicion. How does a family that can barely afford a jar of peanut butter go from scraping by to living in a mini mansion and driving rental cars all over creation? Multiple traffic citations verify this. Literally thousands of pictures of players consorting with a supposedly disassociated booster flood the Internet. This disassociated booster is captured on the sidelines, wearing championship rings, and blabbing all over town about his close relationship with the team. 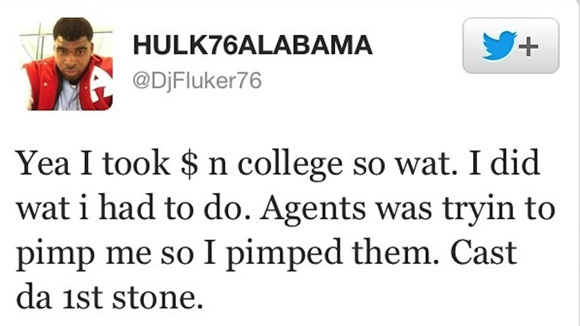 Alabama players whose “struggle is over wit” race to Twitter to display wads of cash. Nobody knew? Nobody was aware? Not a single person on campus had any idea? That defies rational logic. Nobody cared is more like it. Nobody cared because they believe that even when faced with absolute concrete proof they remain untouchable. They believe themselves too big, too powerful, too important to fall. They believe, with justification, that whatever the transgression it will be quietly swept away. Their air of invincibility has justification. Take the media treatment of the recruitment of Dee Liner as a prime example. When Liner was committed to Auburn, his pledge was decried as an affront to human decency. Jeff Sentell of the Birmingham News called out Auburn, saying the program should rescind his offer for the greater good of the game. When Liner flipped his verbal, signed with the rival Crimson Tide and burst onto Twitter with a wad of cash, where was the media outrage then? Where was Sentell’s piousness? Why did Liner’s supposed lack of character suddenly not matter? In August, Liner’s coach suspended him indefinitely and tersely told a Florence newspaper he was more interested in helping Liner as a person than a football player. After Liner signed with Alabama in February, that same coach dismissed Liner’s issues, including the suspension, as misunderstandings. Where did the misinformation, innuendo and perception come from? Boosters with questionable ties including John Phillips, also curiously at the center of the Manziel autograph scandal, former player Luther Davis and T-Town Menswear’s Tom Albetar don’t even attempt to hide their access flaunting championship rings and boasting about their close association with the program on social media and (since expunged) podcasts. In emails, Davis was so unconcerned about potential issues that he labeled invoices with the names of Alabama players. That’s either careless or brash. Why does it seem stories with the potential to damage or defame Alabama are typically minimized? Could it be fear of the backlash and of lost advertisers and ratings? Is it as simple as a self-preserving desire to pander to the power of the masses? Should that it matter more than the truth? The rules cannot be different for one program than they are for another. That’s why this cannot be ignored. The rules exist for a reason. Select programs should not be above them. That’s why those indicting the rules instead of the rule breakers are wrong. The argument most often pushed now is that the NCAA rules are stupid and need to be changed. Suppose for the moment that the rules do require change. Imagine that before next season the NCAA legalizes any sort of pay-for-play a program wants to employ. That still does not change the rules that are in place today or were in place in 2011 and 2012. Those are the rules Fluker allegedly violated. What rules may be in the future have no bearing. When the state changed the speed limit from 55 to 70, did it go back and give refunds to all those ticketed prior to the change? Of course not. That’s where we are today as crickets chirp in the wake of the Yahoo!Sports report. Rules were apparently broken. Compelling evidence is there for anyone to see. We now feel certain that what has often been alleged is probably true. The paper trail is hard to argue. We know the difference between the unsubstantiated gossip that plagued Newton and the stone cold facts that make up the Yahoo! report. It seems clear that the current elephant in the college football room is dirty. No matter what happens from this point, the ballyhooed Crimson championships are tainted. All the things we heard, all the rumors of improprieties that surround the program now carry legitimate weight. They can’t be ignored or casually explained away. There is some satisfaction in knowing that for all the mud that was hurled at Auburn over the last three years, the real mud was apparently piling up in Tuscaloosa. For all the cries of “smoke” that were raised, the fire that caused that smoke was actually raging at the Capstone. Knowledge, though, is not enough. Action is demanded. The hammer must fall. Not just for our own peace of mind, but for the good of the sport. 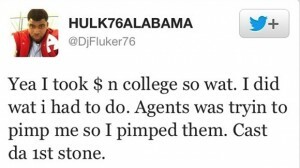 I see you posted Fluker’s alleged statement by Twitter. Did you happen to post the quotes of the HBO four in a a report or did you criticize HBO for having statements from AU players as being shoddy reporting? Did you suggest the hammer fall in that case? apples and oranges. DJ’s tweet was upheld with evidence. The HBO 4 either recanted or were proven liars. More Bama players are being outed as we post over agent-gate. Why does Bama get away with it ? Emmert & Crawford. They still believe in Santa Claus in Alabama.